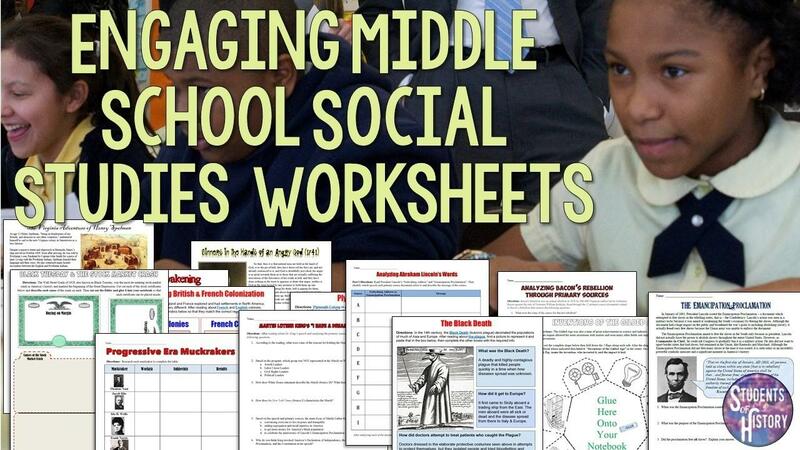 If you are a middle school social studies teacher, I have a TON of awesome worksheets and resources to use in your classroom! No matter if it's US History, World History, or Civics, our site is your "go-to" for engaging 21st Century activities! As I'm sure you know, middle school students need a variety of activities to keep them engaged. You can't rely on doing the same thing every day and expect students to stay interested. That's not to say that worksheets aren't effective, however. They are a great way to introduce primary sources, promote reading and writing, and gauge student understanding. Our curricula include a variety of activities, so each day is a little different, even while you keep students on a routine to manage their behavior. For example, one day they might be going through a primary or secondary source in groups, the next day in mixed pairs, or individually. All of our worksheets for our lessons are clear, with easy-to-follow directions and engaging content. You'll also get answer keys for each resource AND full lesson plans detailing the best ways to use each resource in your classroom! Next, students might be using Google Docs to learn about an event or person in history online and then organize the info in a Google Doc or Digital Interactive Notebook. Our curricula includes Google Doc versions of almost every worksheet so you can use the printable one or have your students work online with laptops, Chromebooks, or their own devices. These digital activities include simple Google Doc versions of worksheets with spaces for students to respond like the ones seen above. We also have hundreds more engaging pages of Digital Interactive Notebooks with Google Drive. These pages allow students to drag-and-drop information, organize information visually, insert images. These digital notebooks are a fantastic way to integrate technology into your classroom and can be completed without printing any paper! Awesome for a 1:1 school or just a trip to the computer lab. There are complete sets of Digital Notebook pages for EVERY unit of each of our engaging curriculum sets. So you can have students working on a variety of activities within that unit both digitally and through printable worksheets. This allows you to mix up your lesson plans and keep students engaged in the content all year long. Our curricula and lesson plans are based on state and Common Core Standards for social studies, so you know you will be covering the essential topics thoroughly. Your pacing is all done for you with each day planned out. Best of all, you don't just get worksheets with a subscription to Students of History. You get EVERY resource you need for an active and engaging middle school classroom. Lesson plans with how to use each resource! You will never have to stress about a lesson again! 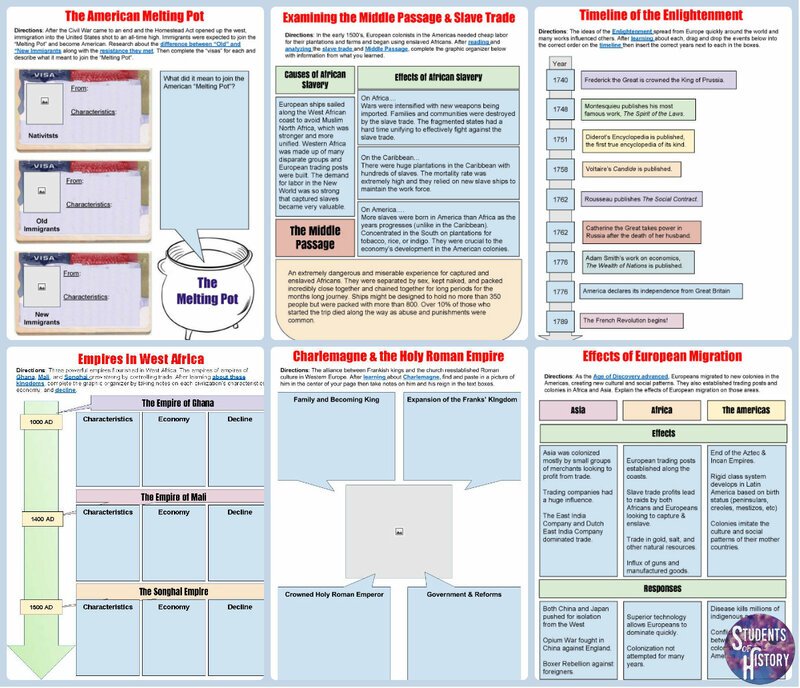 Check out our free resources for a sample of what you can expect for the entire curriculum. Then come back and sign up for a subscription to Students of History. Your mind will be at ease knowing you are providing your students with the most engaging social studies curriculum available anywhere while you are saving hundreds of hours in tedious planning. Want to try some lessons for free? Enter your email to download over 30 pages of free, engaging social studies resources! Don't worry, your information is never shared. 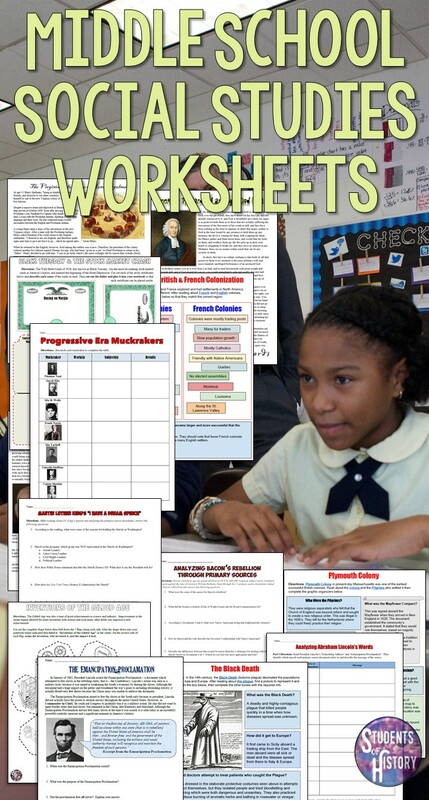 Want some free social studies for your classroom?